Ghanaian international, Kevin-Prince Boateng has been named in coach Ernesto Valverde's 19 players for the El Clásico fixture against Real Madrid. The 31-year old forward completed one of the most surprising moves of the transfer window when he was signed from Italian side Sassuolo on an initial six-month loan with an option to buy. The Ghana star could make his El Classico debut for the Catalans as he has been named in the matchday squad to play Real Madrid CF at the Camp Nou tomorrow, February 6, 2019, in the semi-final first leg of the Spanish Copa del Rey. Boateng could become the second Ghanaian to feature in the world's biggest football fixture after Michael Essien featured in four heated fixtures for Real Madrid. 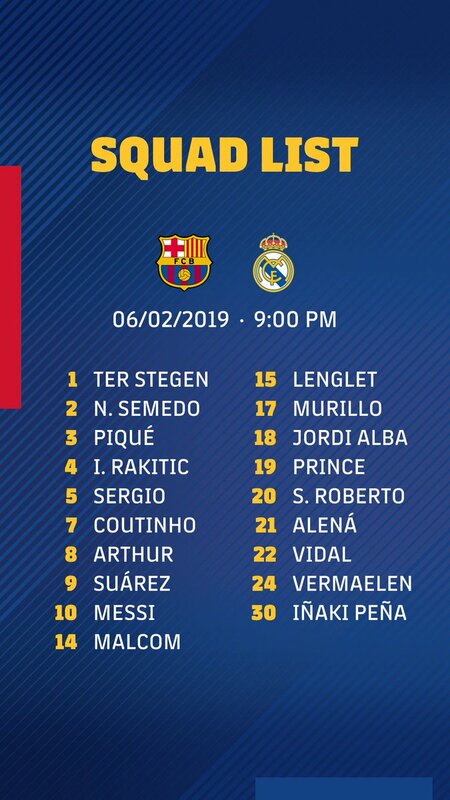 Ter Stegen, N. Semedo, Piqué, I. Rakitic, Sergio, Coutinho, Arthur, Suárez, Messi, Malcom, Lenglet, Murillo, Jordi Alba, Boateng, S. Roberto, Aleñá, Vidal, Vermaelen and Iñaki Peña.